Last weekend I was with four close companions in USA who took me to two Vishnu temples and made me recite Vishnusahasranama. They recite it daily and are devotees whose life exemplifies good values. 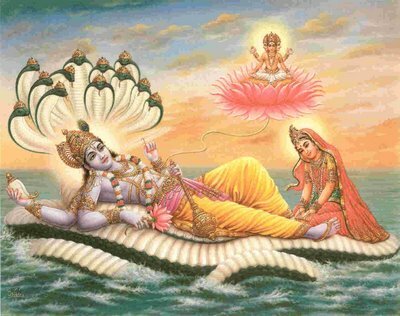 I am stressed out so much by things and happenings, but my deity Narayana is the very embodiment of peace, eventhough he is lying down on a mighty serpent! He is not dependent on anyone else or anything else for bringing him beauty, as he has created the lotus flower himself from his navel and is verily immersing himself in its beauty. No wonder even the gods run to him for succour, he is their absolute master. Not only that, he is the lord of all creation, and as expansive as the sky. His colour of the rain cloud informs of his grace that pours down on all. His very form is so auspicious for me to contemplate. One so much at peace with himself, so creative and expansive, supporting the universe and showering grace, no doubt is the beloved of all prosperity. He seeks nothing, and yet all prosperity comes and woos him. He is full of love, and his eyes show it like two beautiful lotuses. This form is the ideal that yogis envision in their meditation. By bowing down to him, I have no more fear of what transpires in my silly world. He is after all my sole refuge.